This is an oak keyboard stand constructed with a veneer oak finish. The oak keyboard stand has four lockable wheels and interlocks with any of our workstations. It has a small return lip at the back of the unit to prevent the oak keyboard stand from moving. 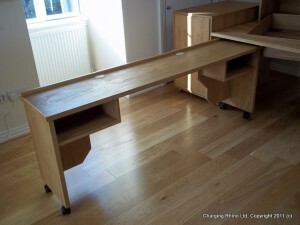 For storage, the oak keyboard stand has two additional shelves beneath the keyboard area. There is also a small cable management area at the rear of the unit. Have a look through our range of workstations we have already made for clients and drop us an email or use the form below and we would be happy to help.